W&W place the Arturia Minimoog V Soft Synth in their top 3 favorite synths. "I think we have the Arturia Minimoog in pretty much something - some part - in almost every single record..." (5:06 into the video) In a Facebook Q&A, a fan asks how he achieves the distinctive piano sound used in his "Starry Eyed" remix, to which Max Vangeli replies, " Well that was actually not a normal House Typical Piano sound, so it was sculpted in the Arturia Minimoog. Basically I was looking for something Phat and Big, so once i had the chords then its all about tweaking the oscilators and filters, and ALWAYS compression of course. But at the end of the day its all about the Chords :)"
"No that is not a looped female vocal. It's an Arturia Minimoog with the LFO speed modulating the cutoff and then run through an Audioease Speakerphone." in this photo we can see till use minimoog vst..
"I often work with a very very simple sub-bass, you can hear it, it's boring... but it just fits to the bass drum. This time it's a Minimoog sound..." (1:18) At 1:37 the camera zooms in on the instance of Minimoog V running on Thomas' left screen. 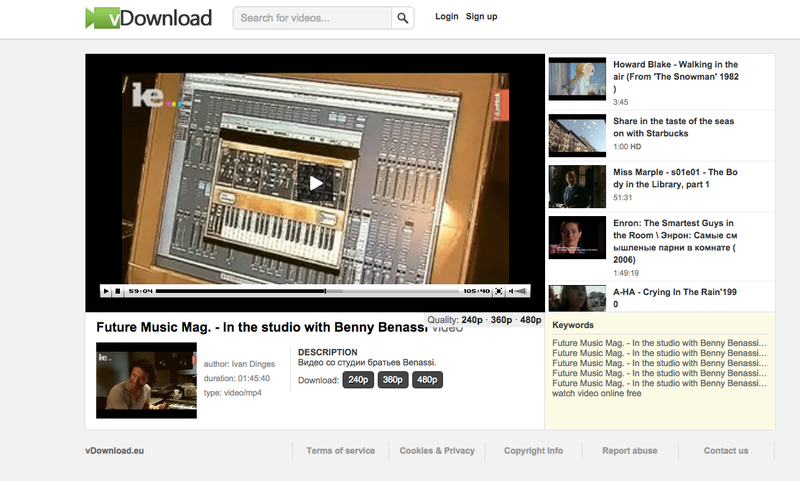 At 59:05 in this [interview with *Future Music Magazine*](http://vdownload.eu/watch/852634-future-music-mag-in-the-studio-with-benny-benassi.html), Alle states "We are going to use the Minimoog V from Arturia. I would like a real Voyager, but who cares?" The plugin can simultaneously be seen on screen at 59:05. At 2:52, Arturia Minimoog can be seen on Vince's computer screen. At the beginning of this video, Sébastien Léger describes his use of Arturia Minimoog; "So, I used the Minimoog from Arturia. I actually always use the Minimoog from Arturia for all my bass lines, because I know it, [it] sounds good and [it's] very easy to use." When asked what plug in that they find themselves using over and over again, one of the answers was "Arturia Minimoog". This can be seen at 4:09 of their interview with BPM-TV. In the studio, Matt played Wurly, Hammond B-3, and Hohner Clavinet. He brought in a trio of Rolands from his live rig—Jupiter-6, Juno-106, and Fantom-G—then fleshed things out with Arturia Minimoog V and Prophet V soft synths, and “a little bit” of Reason programming. 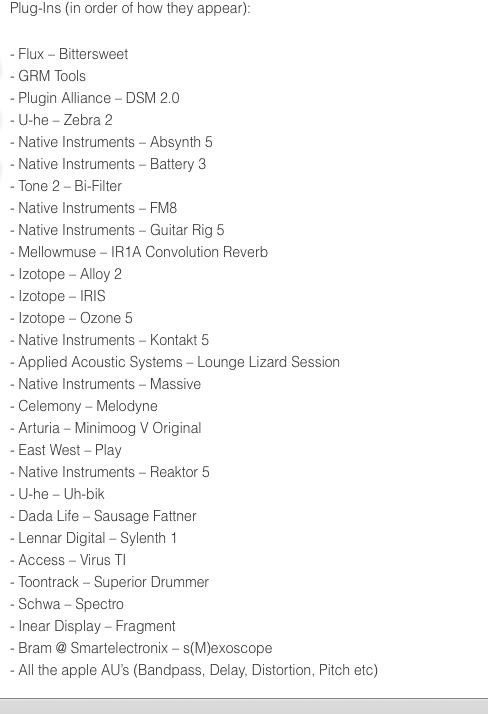 Arturia Minimoog is listed among the software Mark uses in his studio. In this “In The Studio” video, Tom Staar explains that lots of his main lead sounds are made from very simple sounds, which he then processes heavily with effects plugins to make them bigger and wider. Starting at 0:51, he shows the original saw-like sound came from the Arturia Mini V Software Synthesizer, which he uses “for quite a lot of things”. Mr. Bill uses Arturia Minimoog Mini V Software Synthesizer, as listed in [this interview](http://blog.liveschool.net/mr-bill-qa/). At 4:26 it shows Arturia Minimoog V plugin that was used for "All Night Long"
In this video at 0:05 he is using mini v software synthesizer. I've always worked with Cubase and create my sounds with additional VST instruments. I love the digital Minimoog from Arturia, which can be layered in such great detail. Two-tone bass romance. The Minimoog is perfect for that. "This is the major machine," says Paul Epworth of his Roland SH5, "though the bottom end isn't so good, and for that reason, for bass lines I tend to use the Arturia Minimoog." Arturia MiniMoog V is featured in the "Software" list on Gareth Jones' website. I nabbed it back when Arturia was handing liscenses of these for free, but I picked up an official liscense of it in a bundle and have no regrets. Freebie lacked patch tinkering and certain refinements but the full on liscense breaths better life into the program. Can get a bit CPU heavy... Okay it can downright bog your machine down on some patches if you're running an old 2nd gen i7 laptop like myself. But it sounds really close to the real deal. Just give it a little tube warmth and it will sound spot on. i love that TAE (True Analog Emulation) power. arturia have really got that nailed down. Amazing software sythesizer. definitely cant complain! Perfect for making old school sounding synths and can get some brilliant analogue bass sounds out of it! wait, if sylenth is the best how can this model D simulation also be the best? I have the real Minimoog and the Arturia Software version and I can say the sound is incredibly the same. Our quick go-to for classic sounds. Warm, fuzzy and fat. Love it. I don't think I'll ever be able to afford a real Minimoog Voyager, nor have the space, but this synth is great at replicating analogue sounds well, and I got it for half price in a plugin boutique sale!